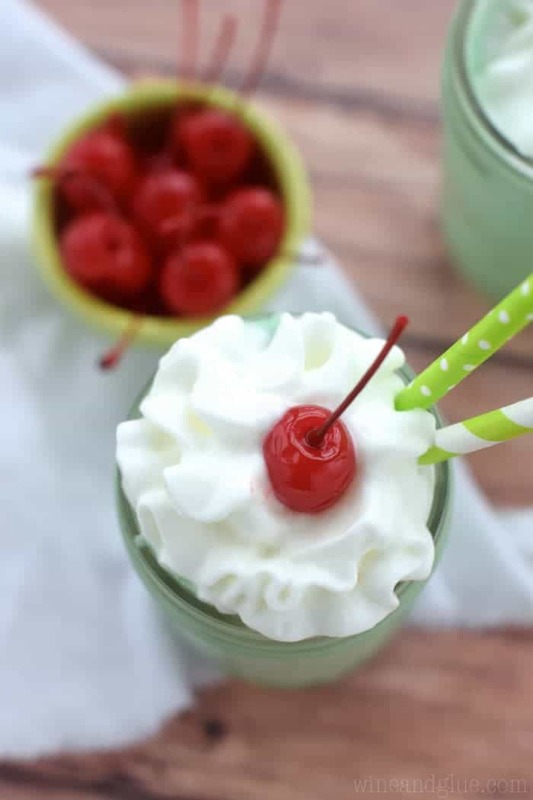 This Skinny Shamrock Shake is a much lighter way to enjoy this fun treat! You guys, why does weight loss have to be so hard? Uuuuuughhhh! My problem is that I get within about three pounds of my goal weight and get really pumped feeling all like a rock star and then I decide that I can eat nachos and beer for dinner. Which probably wouldn’t have been that big of a deal when four kids and 10 years ago. Alas . . . . that is not where we are at. So . . . . it is back to counting calories for me. Which I absolutely loathe. But it works. I remember a friend of mine (a really good friend, who also happens to be obnoxiously skinny) once said to me that losing weight really isn’t that hard. It’s just a matter of math. You can’t put in more than you put out. Barf. So in the spirit of counting calories and because I gave you not one but TWO bacon-licious recipes last week (this one and this one). I am now giving you Skinny Shamrock Shake. Okay, let’s get real about two things. 1. This is a Skinny Shamrock Shake. It’s not a Calorie Free Shamrock Shake. It is made with bananas, which are healthy for you, but also bring about 100 calories per serving to the party. So it’s a lighter treat, but definitely one that should be enjoyed in moderation. Did I say BARF yet? 2. This Skinny Shamrock Shake is totally delicious, but NOT identical to it’s rich and calorie intense older sister. She’s made from bananas, cut her some slack. That said, it’s really really good and very reminiscent of the original. I tried first making it with vanilla extract to replicate the vanilla ice cream taste, but that just didn’t jive with the mint extract. So then I used vanilla soy milk, and it worked out much better. If you don’t want to buy a big carton of soy milk, then just get a little milk box of vanilla cow’s milk, they sell them in the milk section at Target. Should work the same. In a food processor blend the frozen bananas until smooth. Add 1/3 a cup soy milk or more if needed to thin it out. Add the mint extract, 8 drops of green food coloring, and the agave nectar. Optional: top with fat free whip cream and maraschino cherries. I use a food processor to blend this all together because I feel like it can handle the frozen bananas better than my cheap mixer, but you know your appliances better than I do. Don't use peppermint extract. It's not the same thing. Start with 1 tsp of agave nectar and see if you want it sweeter before adding the second. I know there are lots of folks out there with kids that are sensitive to food coloring, so feel free to skip it. It doesn't change the taste, it's just there for fun. It’s a never ending battle isn’t it This shake reminds me of those yummy grasshopper frozen boozy drinks. I will have to give this one a try. Probably a bit better for breakfast right? I totally hear you! I am all “oh I had a great day today” and then my boyfriend wants chocolate chip cookies and all my efforts are wasted. Ugh, I wish they could skinnify Reese’s somehow. Then I’d be in much better shape. She improvised a bit & made a 2nd batch with some honey instead of agave. Yummy! Thanks Doug! Always great to hear when a recipe turns out well, and honey is a great replacement for agave! I HATE bananas. Can you taste the banana at all?? I would love to try this, but am afraid of the banana taste. Hmmmm . . . I feel like if you hate bananas, like capital letters HATE bananas, this might not be the right dessert for you. 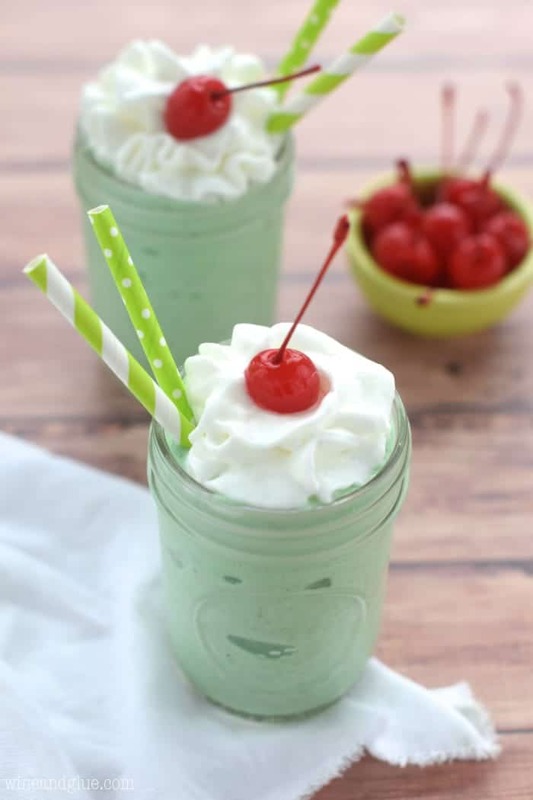 Love love love shamrock shakes, so I’m definitely going to try this one out. Thank you so much for the recipe. I love this! I make smoothies 2x-3x a day and never thought of this. (I actually added spinach and silken tofu to it to make it a substantial meal) Genius! Today’s the 2nd time I’ve made this shamrock recipe it’s very good 🙂 thanks!! Thanks Jess! I appreciate it so much when people come back to share that they enjoyed a recipe! Thank you so much for this! I am having guests over and wanted to make a St. Patrick’s day dessert but am currently doing the 21 day fix from beachbody. Now I can make all my family and guests the real thing and I can have this. They’ll never know! Oh good Kami! I hope you like it! This looks yummy! 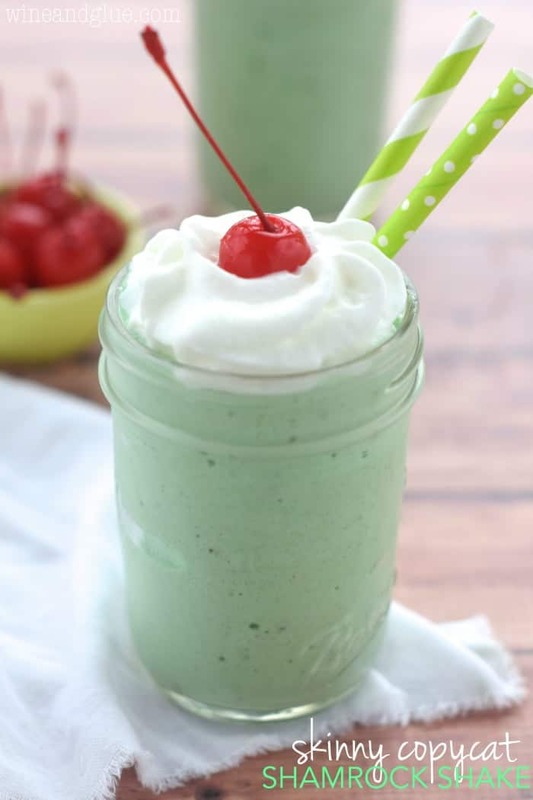 Just stopping by to let you know your skinny shamrock shake is featured in a St. Patrick’s Day roundup over at The Pin Junkie. Adding mint to this shake really gave it an awesome kick which I totally loved. Thanks for sharing this. My kids loved it today. We made this Shake last night! Yummy! It turned out great and it makes a great eve. It will be the “go-to” key Shake recipe.